Analysis: Lee was drafted by the Jaguars in the sixth round of the 2018 NFL Draft and garners a spot on the team's active roster for the season finale. 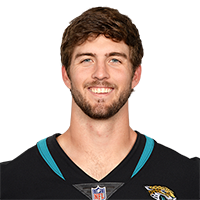 With Cody Kessler (shoulder) nursing an injury and Blake Bortles only having a precarious hold on the starting job, it wouldn't be out of the question for Lee to see offensive snaps versus the Texans on Sunday. Analysis: The team's sixth-round pick in April's draft, Lee was shaky during the preseason. He was a long shot to make the roster in the first place since Blake Bortles and Cody Kessler are already on the squad. Analysis: Lee was sacked five times and fumbled twice despite playing only nine offensive snaps. The rookie sixth-round pick was unlikely to unseat Cody Kessler as the Jaguars' backup quarterback, and Thursday's effort strengthened that notion. The 25-year-old should see a higher volume of reps in coming preseason games, but he seems like a prime candidate for the practice squad, at best. There are no videos available for Tanner Lee. Click here to view all videos.